3’ - This one is #testy already. Also, #tasty . 4’ - As expected, Rose filling the role as the holder between he and Friberg. The latter trekking forward. Donovan Ricketts fails to catch an errant Seattle shot and it falls perfectly to Clint Dempsey who scores. Calamitous bit of (non) communication between Gonzalez and Ricketts sees Ricketts fumble and Dempsey lash home. 1-0 SEA. 6’ - Welp. Galaxy goal. Lletget. We’re in for a doozy, folks. 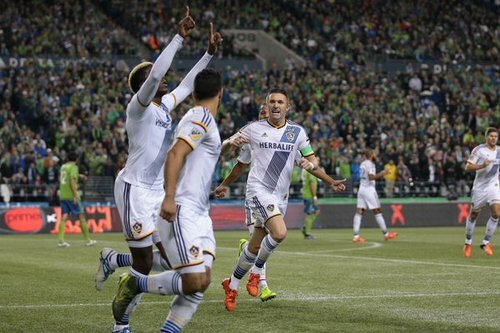 Sebastian Lletget with a cool finish after the lay off by Gyasi Zardes. We're all level. 8’ - I still haven’t had time to mentally process what audiobook Donovan Ricketts was listening to on Dempsey’s goal. Giovani dos Santos with the perfectly weighted ball to Gyasi Zardes who taps it to Sebastian Lletget for the finish. Class goal. 9’ - Can we talk about how Gerrard runs like he’s a 15-year-old dog walking to bed on its tiptoes.
.@clint_dempsey getting straight down to business ???? 13’ - Valdez is such a predator. Beauty of a ball from Ivanschitz and Nelson slid under it like he was sliding home from the outfield. Nelson Valdez with the finish off the Andres Ivanschitz free kick. Looked like Valdez was a yard or a half offside. 15' Incredibly tough start for Donovan Ricketts and the #LAGalaxy defense who have seen two communication issues result in goals.